After the collapse of the Mongol Tamerlane‘s empire in the 1400s AD, many smaller states replaced the one big empire of the Middle Ages. One of the most powerful was the Uzbek empire of Bukhara, north of the Caspian Sea. The Uzbeks were Turkic speakers and Muslims. By 1500, the Uzbek Empire included the powerful Silk Road cities of Tashkent, Bukhara, Samarkand, Kabul, and Herat. The Uzbeks suffered many attacks by Babur, the Sultan of the Mughal Empire in India, but they successfully fought him off. This victory was quickly followed by a major defeat, however, when in 1510 the Uzbeks lost the city of Herat and the Persian province of Khurasan to their Safavid neighbors. The Uzbeks and the Safavids kept on fighting over Khurasan through the rest of the 1500s AD, and Khurasan changed hands many more times. Whenever the Safavids were busy fighting the Ottomans or the Mughals, the Uzbeks would take advantage of that to attack them. 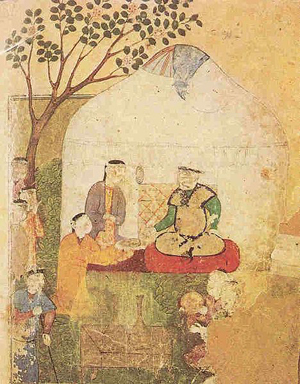 In 1740, the Safavid ruler Nadir Shah conquered the Uzbeks. But when Nadir Shah died seven years later, the Uzbeks got back their independence. By the 1850s, the growing Russian Empire conquered Uzbekistan and made it part of the Russian Empire. When the Russians conquered Uzbekistan, they were interested in growing a lot of cotton – as everybody was in the early 1800s, because of the invention of the cotton gin. The Russian czars forced farmers to plant cotton on most of the farmland in Uzbekistan. Planting so much cotton caused water shortages and a lot of pollution. Uzbekistan remained part of the Russian Empire until 1991, when the Russian Empire’s weakness allowed Uzbekistan to regain its independence. Today Uzbekistan no longer includes Herat or Kabul (which are in Afghanistan), but it still holds Samarkand, Bukhara, and Tashkent. 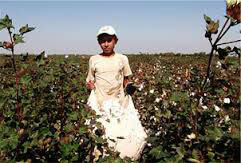 And Uzbek children still pick cotton under terrible conditions. Cite this page: Carr, K.E. Uzbeks – Uzbekistan and Central Asian History. Quatr.us Study Guides, May 31, 2017. Web. April 23, 2019.